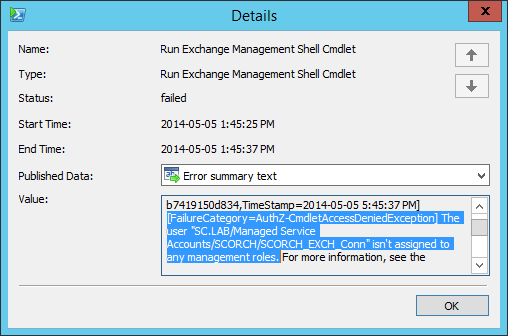 While implementing System Center 2012 R2 Orchestrator for a client, I encountered this error when trying to setup/test connectivity into their Exchange environment. So, as all good consultants do, we go to our lab and try to mimic the environment/scenario. So in my lab, I am running System Center 2012 R2 Orchestrator (with no Update Rollups), and Exchange 2013 (even though the client was running 2010). Even to perform a simple “test” connection, I was following this TechNet article: http://blogs.technet.com/b/privatecloud/archive/2013/06/12/automation-orchestrator-and-the-exchange-powershell-activity.aspx; hence the simple “Get-User” command. And I triple checked to ensure that I followed the configuration steps correctly, as detailed here: http://technet.microsoft.com/en-us/library/jj614529.aspx. Error(s) executing PowerShell command: System.Management.Automation.Remoting.PSRemotingTransportException: Connecting to remote server failed with the following error message : [ClientAccessServer=EXCHANGE,BackEndServer=,RequestId=0c197f44-6055-4210-993d-b1593149e876,TimeStamp=2014-05-05 6:13:19 PM] Access is denied. For more information, see the about_Remote_Troubleshooting Help topic.. Inner exception: . Command info: Command name: New-PSSession. 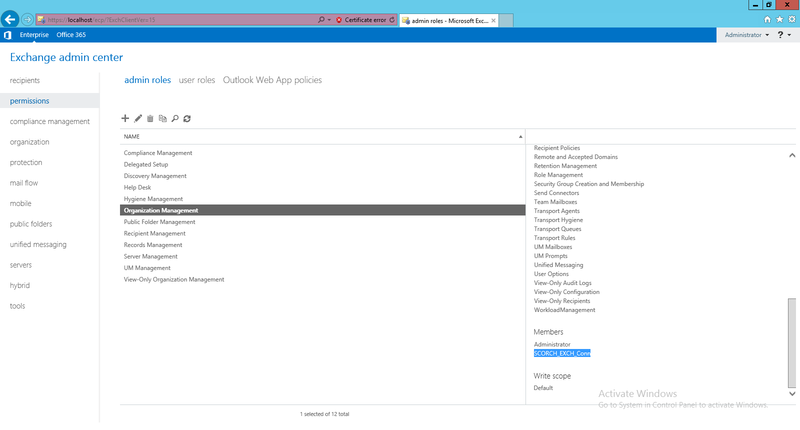 Parameters: [ConfigurationName:Microsoft.Exchange],[ConnectionUri:https://exchange.sc.lab/powershell%5D,%5BCredential:System.Management.Automation.PSCredential%5D,%5BAuthentication:Basic%5D,%5BSessionOption:System.Management.Automation.Remoting.PSSessionOption%5D.. So I searched online using multiple search terms like: “Orchestrator Exchange Admin Integration Pack Issues”, “Error opening remote PowerShell runspace to Exchange”, “ExchangeGatewayException” and “Exchange Admin integration pack access denied”, to name a few. I searched the web for hours and hours, finding information about ExchangeGatewayException, but nothing that specifically referenced the “CheckErrors” element. Then I came across this across this blog article: http://dynamicdatacenter.wordpress.com/2014/01/15/orchestrator-automate-exchange-actions/. However, you will notice in that reference article, that the error they were getting was different from mine. BUT, something stood out to me. Take a second look at the second last screenshot. The one showing the Connection Configuration settings. I noticed that in their screenshot, that the Exchange User Name included the DOMAIN\Username. That was interesting, since my connection configuration did not. So, I added it. 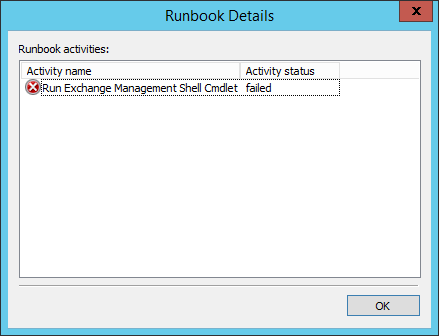 After adding the DOMAIN\Username format to the Exchange User Name field, I then re-tested the simple connection Runbook. I still encountered an error with the Runbook, but this time it was much more helpful. Notice in the Error Details, that it now says “[FailureCategory=AuthZ-CmdletAccessDeniedException] The user “DOMAIN/OU/ServiceAccount” isn’t assigned to any management roles.” That’s much more helpful. Error(s) executing PowerShell command: System.Management.Automation.Remoting.PSRemotingTransportException: Processing data from remote server failed with the following error message: [ClientAccessServer=EXCHANGE,BackEndServer=exchange.sc.lab,RequestId=f06caef2-2f46-424e-b6ec-b7419150d834,TimeStamp=2014-05-05 5:45:37 PM] [FailureCategory=AuthZ-CmdletAccessDeniedException] The user “SC.LAB/Managed Service Accounts/SCORCH/SCORCH_EXCH_Conn” isn’t assigned to any management roles. For more information, see the about_Remote_Troubleshooting Help topic.. Inner exception: . Command info: Command name: New-PSSession. 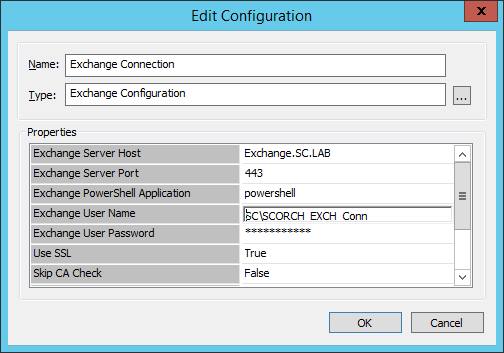 Parameters: [ConfigurationName:Microsoft.Exchange],[ConnectionUri:http://exchange.sc.lab/powershell%5D,%5BCredential:System.Management.Automation.PSCredential%5D,%5BAuthentication:Basic%5D.. So, since we now have the information that our Service Account isn’t assigned to any Management Roles, we now have a direction to look/correct. I am not an Exchange Administrator, so there could be a more appropriate role to assign it; however, keep in mind that this Service Account will be used to automate any/all Exchange-related Activities from Orchestrator, so it will require sufficient privileges to do so. After I applied the changes by adding the Service Account to the role, I re-ran the Runbook test again. 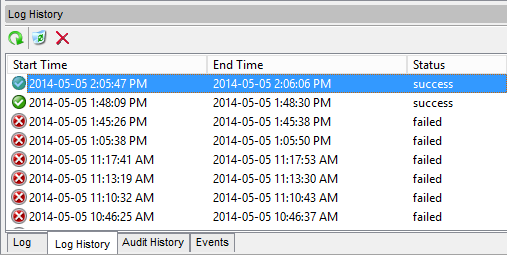 This time, it was able to successfully complete the simple “Get-User” command against the remote Exchange server. I even tested the connection using SSL and without SSL, and both attempts were successful. I really hope this post will help someone, as it took me the better part of a day to search, and test to be able to finally come to a solution.